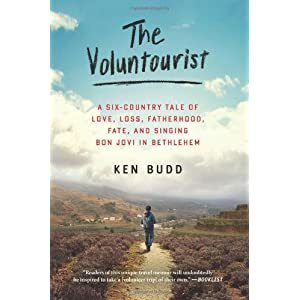 The Voluntourist: A Six-Country Tale of Love, Loss, Fatherhood, Fate, and Singing Bon Jovi in Bethlehem by Ken Budd starts with the line, “I want to live a life that matters,” and so he does. Inspired by the need to deal with the loss of his father, he searches for answers, but this quest requires a passport and patience. Patience to wait in line at customs, for airplanes, for young children in China and Costa Rica, for Ecuadorian birds to fly in the cloud forest, and for all things in Palestine. His expeditions out of his normal routine help him to elucidate his grief. He takes the time to mourn his father and to look at his life while also mourning that he will not be a father. As he says, “Sometimes in life, you can drive a familiar road and still not now where you’re going.” But Ken Budd is forcing himself to change his life and help others although while in the South American cloud forest, as in so many of his volunteer sites, he wonders, “What good are we actually doing here?” It does seem that the person who gets the most benefit from volunteering is the volunteer, although Budd clearly shows how much the programs he participates in -- from teaching English in Costa Rica to feeding lunch in Kenya -- do help the locals with whom he interacts. Budd recounts reading the Tibetan lama Sakyong Mipham and his words, “Thinking we have all the time in the world, we waste it.” Budd does not waste his time. As his dad told him, “if you’re going to do something, Budo, always do it right.” Although in the beginning it does seems as if his “renewed quest to be a better person began with [his] being a selfish jerk.” Budd does “fling [himself] around the globe” without his wife, and getting out of his comfort zone to heal after his father’s death does stand a chance of ruining his relationship with his wife, who does not want to be a mother. He shares many moving moments from his assignments and I do like when he says while in Ecuador improvising, “Enjoy what you have instead of lamenting what you lack.” Budd’s evolution to a person who really appreciates what he has is worth reading. I hope the reader becomes inspired to take a journey and see just how lucky you are! Budd's ultimate message may be summed up: "Don’t wait to cherish your life! Start today!"